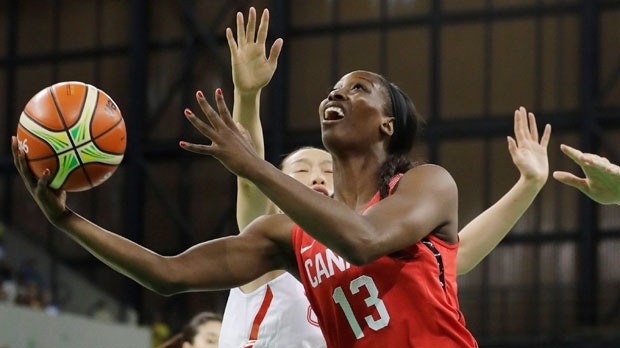 TORONTO -- The Toronto Raptors have named Tamara Tatham as a mentor coach for with Raptors 905, making the two-time Olympian the first Canadian woman to join the staff of a G League team. Tatham, from Brampton, Ont., will join Jama Mahlalela's next season and be mentored by the Raptors 905 head coach as the Raptors seek to grow and develop Canadian coaching talent. Tatham said she didn't know she was the first Canadian woman to join the G League's coaching ranks. "I saw that this morning, and I was like 'Wow, that's intense.' But I'm excited about it," Tatham told The Canadian Press on Wednesday. "I'm not going to say I'm nervous, I'm not going to say I'm not nervous, but I'm going to say it's a blessing because it's not something that comes around every day." Tatham had a successful professional career overseas after starring at the University of Massachusetts for four seasons. She helped Canada win gold on home soil at the 2015 Pan Am Games in Toronto and the 2015 FIBA Americas women's championship in Edmonton. She was also part of the Canadian runner-up team at the 2013 Americas tournament in Mexico City. She retired from Canada's national team in 2017 and was an assistant coach for the University of Toronto women's squad last season. "I've played basketball my entire life, started coaching, so I know a lot about the game and I know what I can give to the game, and to the younger generation," she said. "I'm really excited to have this opportunity to really showcase, not just for women, but for the Canadian culture. Jama's given me a huge opportunity as a Canadian coach to learn from some of the best, and that's something I really am excited about." Raptors 905 announced that Charles Kissi, Charles Dube-Brais, Trevor Pridie and Arsalan Jamil have been added to Mahlalela's staff while A.J. Diggs and Ryan Schmidt are returning for a second season. Toronto native Justin Alliman will join Tatham as a mentor coach. Raptors 905, which plays out of the Paramount Fine Foods Centre in Mississauga, Ont., won the G League title in 2016-17 and advanced to the league final last season.